With experience gained from sub-contract production of a aircraft designed by other manufacturers, in particular, the Thomas-Morse MB-3A, Boeing began the private-venture development of a single-seat fighter under the designation Boeing Model 15. First flown on 2 June 1923, it was a single-bay biplane with wings of unequal span, the lower wing also being of reduced span and chord. The wings were of wooden construction, fabric-covered, but the fuselage was of welded steel tube. 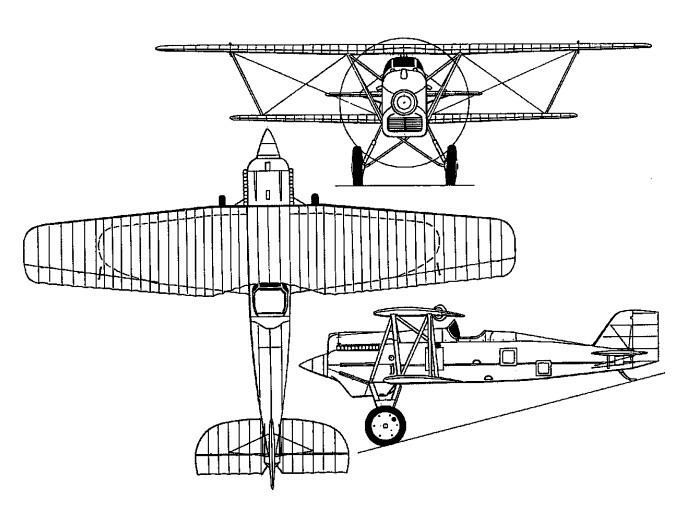 The braced tail unit was also of wood, and incorporated a variable-incidence tailplane that could be adjusted in flight. Landing gear was of fixed tailskid, with through-axle main units, and power was provided by a 324kW / 375 hp Curtiss D-12 inline engine. The design featured an underslung sloping core radiator with small frontal area, and an elliptical lower wing and tapered upper wing. The US Army became interested in the Model 15 before it was flown, and was evaluated by the US Army at McCook Field, under the designation XPW-9. It was flown in competition against a Fokker XPW-7 and Curtiss XPW-8A, wining an order for two extra XPW-9s for more extensive evaluation; these were delivered in May 1924. The third of the aircraft differed by having divided-axle instead of through-axle main landing gear units, and it was this type of landing gear that was chosen for the 30 examples of the production PW-9 ordered in two batches (12 and 18) in September and December 1925 respectively. The US Navy was as keen as the US Army to acquire examples of Boeing's new fighter, and the first of an order of 14 for service with the US Marine Corps, under the designation FB-1, were delivered on 1 December 1925 to the shore-based fighter squadrons VF-1M, -2M and -3M. They were used in 1927 and 1928 by the US Expeditionary Force in China. Only 10 were produced as FB-1s, these being virtually identical to the US Army's PW-9 (Boeing Model 15), having the same 435-hp Curtiss D-12 engine and two-gun armament. The 11th and 12th aircraft on this order introduced the 380kW Packard 1A-1500 inline engine, and were equipped with through-axle landing gear and an arrester hook for operation from aircraft-carriers. The change resulted in redesignation by the US Navy to FB-2 (Boeing Model 53); the 13th aircraft was identical to the FB-2, except for twin, float landing gear, and was designated FB-3 (Boeing Model 55); and the 14th and last of the US Navy's initial order also had twin floats, but introduced a 336kW Wright P-1 radial engine, becoming redesignated FB-4 (Boeing Model 54) or FB-6 with the 298kW Pratt & Whitney Wasp. The development ultimately led to the FB-5 produced during 1926-27. The FB-5 for the US Navy (Boeing Model 67), differed from the FB-1 in having a 520-hp Packard 2A-1500 engine, increased wing stagger, and a balanced rudder. Twenty-seven were deli-vered in January 1927 to Marine fighter squadrons VF-1B and VF-6B for service aboard the Langley. Ceiling: 20,000 ft (6,000m) fully loaded.